Moulin Rouge was released in 2001 and it managed to do two impressive things: it made a decent amount of money and it was nominated for a best picture Oscar. Those two things were made a lot more amazing because the movie happened to be a musical, a genre many people thought was as good as dead. Ever since then we have had a couple of high profile musicals coming out every year, the latest being Hairspray, which opened this weekend. In celebration of that opening, here is a look at some of the posters for recent musicals, ordered chronologically. The one that restarted it all. The poster uses a bold red and has the characters caught in the middle of a very passionate kiss. The imagery is striking, much like the movie. 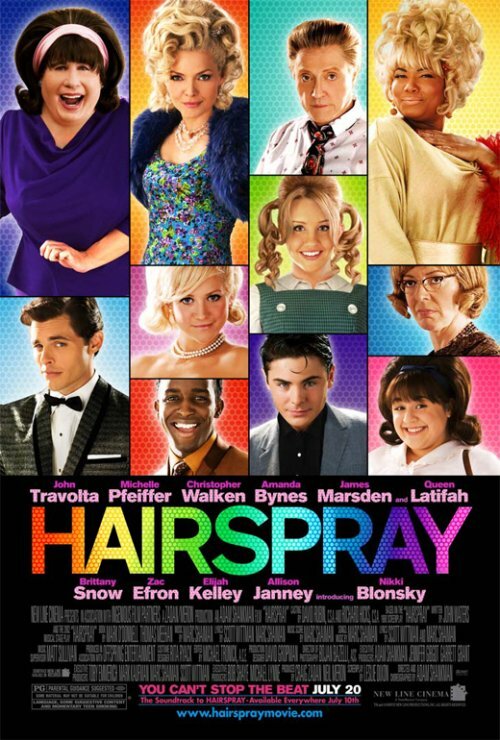 This final poster for Hairspray travels some of the same paths that the earlier posters travelled. Colorful! Fun! Fifties! Music! Star filled ensemble! And it does a good job of packing all that in. But with a musical, more than with any other kind of film, the trailer is the one that is going to have to do the majority of the selling. The poster does I nice job of reminding us of the film, but it won’t really make anybody interested on the film by itself. 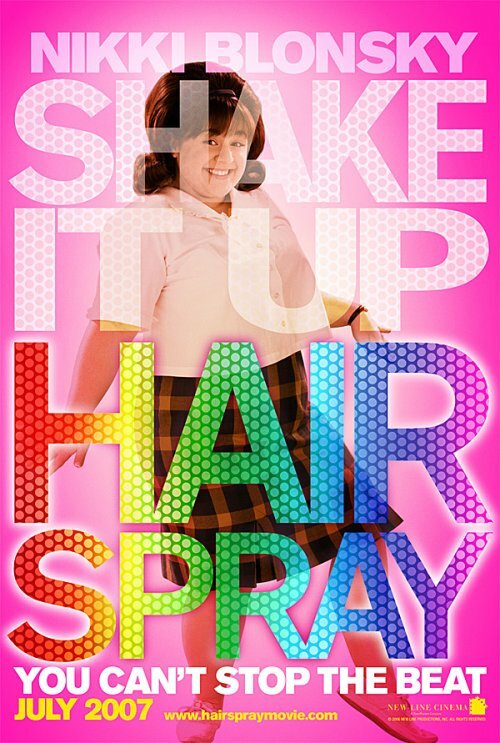 Tommy DiChiara over at Cinematical has just posted ten brand new character posters from Hairspray, and they all look very much like the one above. Sure, the character changes, a little bit of the text changes and each one of the posters has a different, albeit equally loud, background color. But the overall effect is one of sameness, especially because the title takes so much space. Still, I like the overall playful, colourful style they are going for. Will the film be equally playful and colourful? And more importantly, will it be fun? We’ll see. It’s colorful! It’s got pics of everybody, showcasing that the film has a large cast of well known actors! 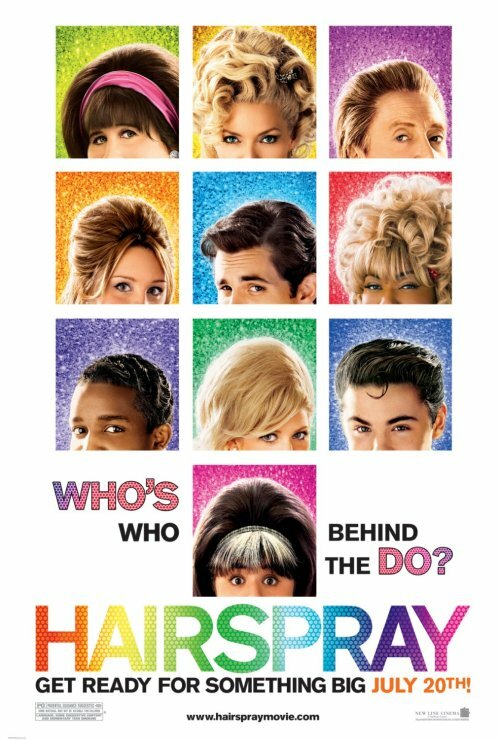 It shows their hair, which is not only a clever visual pun but also shows that the movie doesn’t take itself too seriously! Am I excited? Not yet! But I do think it will work pretty well with the intended audience! Ok, I’ll stop with the exclamation points now. But seriously, I think it’s a pretty good poster that conveys exactly what it wants to convey.